Place chocolate in a small bowl. In a small saucepan, bring cream and corn syrup just to a boil. Pour over chocolate; let stand for 5 minutes (do not stir). Whisk chocolate mixture until smooth. Stir in 1/4 cup coconut, 1/4 cup pecans, coconut extract and salt. Cover and refrigerate for at least 1 hour or until firm. Shape chocolate mixture into 1-in. 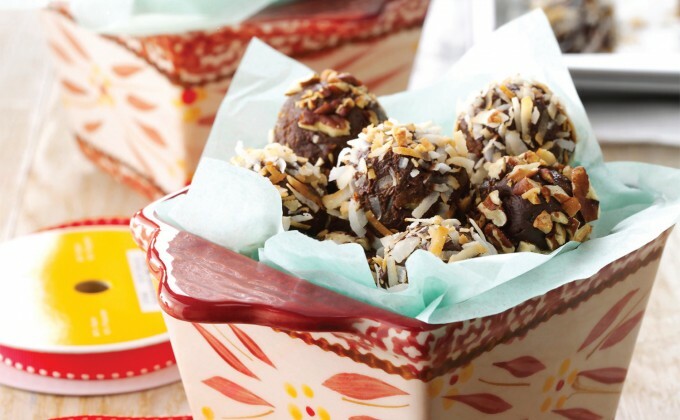 balls; roll in remaining coconut and pecans. Store in an airtight container in the refrigerator. For gift giving, arrange in temp-tations® 10 ounce EZ Hold bakers.